This is the view from my sister Eileen's place on Squam Lake. Isn't is breath-taking? 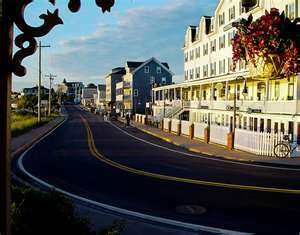 We just had a family reunion weekend there. We swam and played games and took a boat ride. It was wonderful. This is the lake where the movie "On Golden Pond" was made. Tomorrow I'll show you a quilt that she made. This is Garen from the UK. 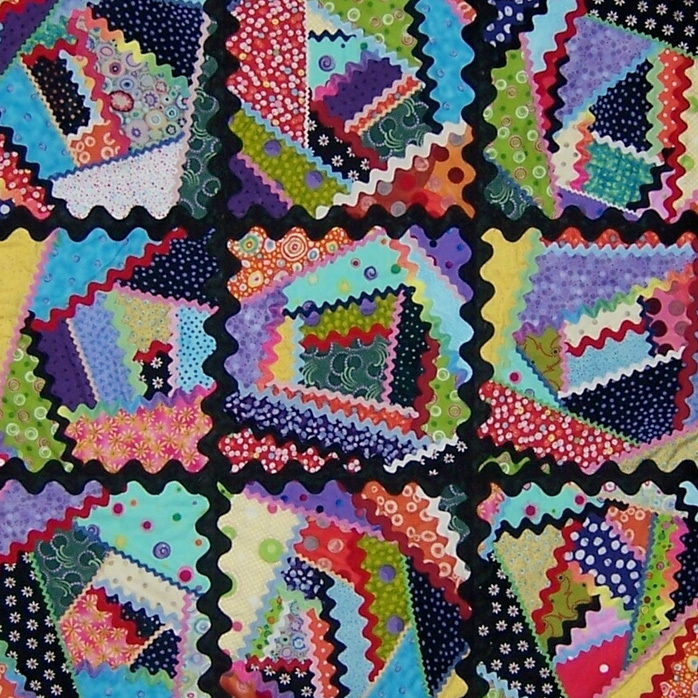 You may know her from seeing her comments on the quilting blogs as Quintada Quilter. Garen spends summers in Connecticut so we met for a delightful lunch and visit. Then we decided to go play in my quilt room. We had the best time! 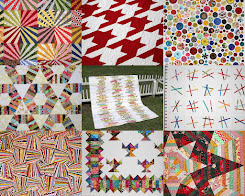 Quilt blogs help us meet such sweet friends! 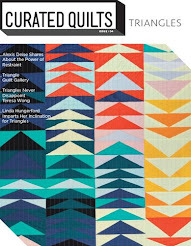 This is Dinah Snyder's first selvage quilt. It measures 84" square and it barely made a dent in her selvage stash! She likes to cut her selvages wide so they show a good amount of the printed fabric, but even so! Dinah used the quilt-as-you-go method. I love how she put the blue plaid strip in the middle of each block to get the nice trellis effect. 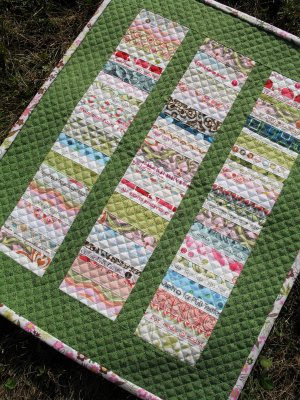 Such a classic string quilt! Dinah is a second grade teacher in Indiana. She has quilts on display in her school that she made with her students. Can you imagine learning about quilting as a second grader? Lucky kids! 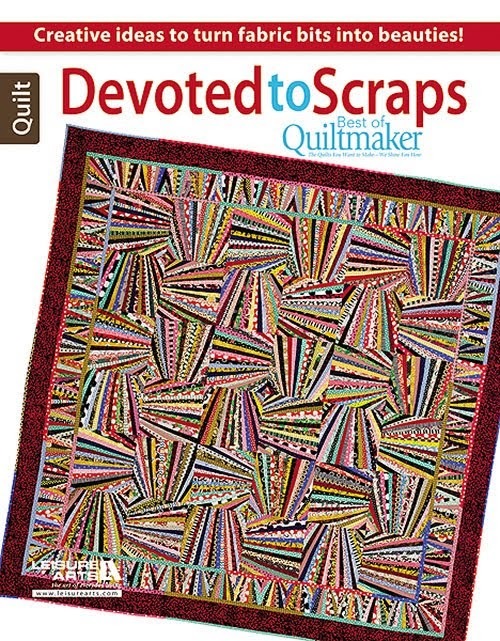 I think Dinah needs a blog; it would be so interesting to see a tutorial for this quilt and see what she's making with the kids. Great job, Dinah! 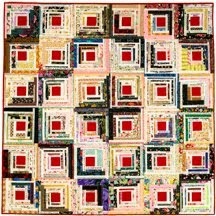 This lovely selvage coins quilt was made by Susan in Pennsylvania. Her blog is Hanging On by a Needle and Thread. I like all the soft colors paired with the solid green. And look at all that cross-hatch quilting! Nice job, Susan! Thanks to Pokeytown Kim for alerting me to this selvage news. 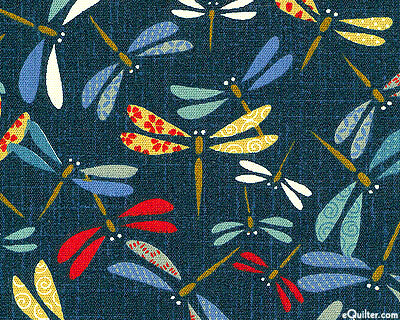 I have a little collection of Japanese indigo prints, but this is the first time I've seen them with more colors added. I like these little patterns. They're all featured on the page of new items on eQuilter. Maybe a little red silk would look nice with these. 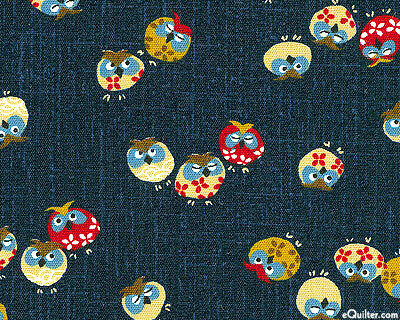 My favorite is the owls. 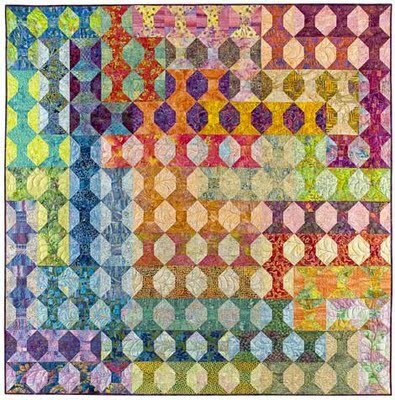 This quilt is featured on Anne-Grethes Quiltblog. 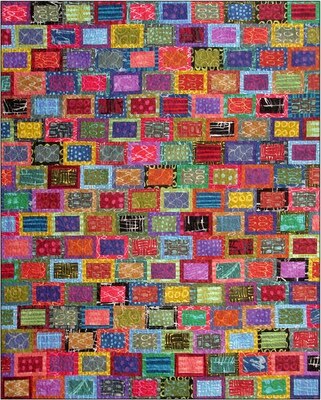 It was part of a fund-raising event sponsored by her quilt group in Norway to benefit a school and a hospital. They also donated quilts for kids. 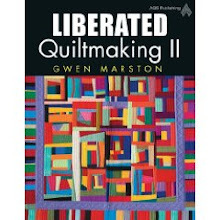 Isn't this a clever liberated house quilt? The pattern is by Buggy Barn. The combination of high and low contrast areas is striking. Great trees too. 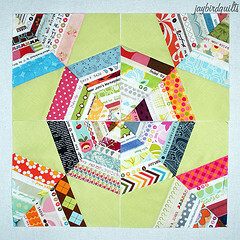 Another Norweigan quilt blog that I like is Abyquilt, May Brit's blog. You may want to leave some hugs in connection with the recent tradgedy there. So much suffering, very sad. 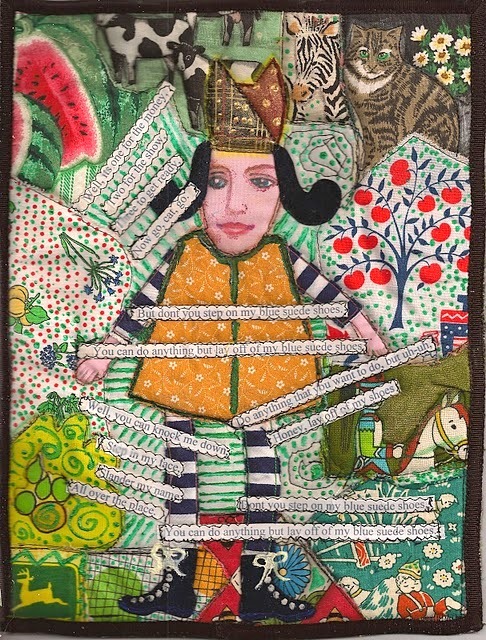 This beautiful crazy quilt was made by a member of the Georgia Quilt Council as part of an exhibit in Savannah, GA that happened about 4 years ago. This isn't exactly breaking news I know, but this photo was still out there in cyberspace and I was delighted to find it. The black jumbo ric-rac looks great, doesn't it? Carol from the Rocky Mountains and Swallowcliffs blog admits that she's an artaholic, but she doesn't need a cure, just more art. 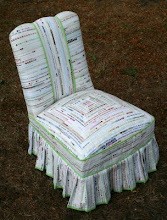 Visit her blog for inspiration from art journals, portraits, rock arrangements in her yard, and more. 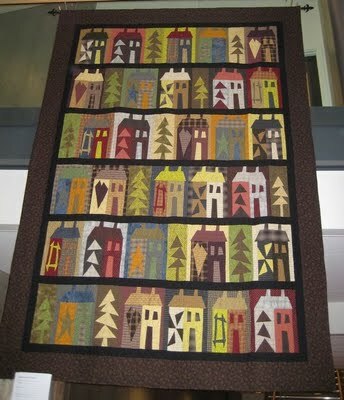 You can also see a larger version of the quilt pictured above. Look at those socks and shoes! This is so clever! 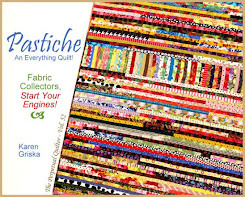 Attention machine quilters and machine quilter wanna-bees (like me)! Leah Day has come up with 300 machine quilting designs and she's still going strong. Her newest design (above) is called "Edge of Reality." 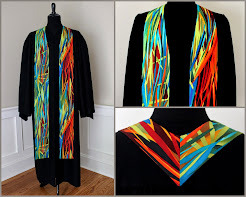 Take a look at her websites The Free Motion Quilting Project and Day Style Designs. She has tutorials for each of her designs and they are so much fun to watch. She told me that she films the video first, then adds the voice-over afterwards. She makes it look so easy. I'm very inspired by Leah Day. 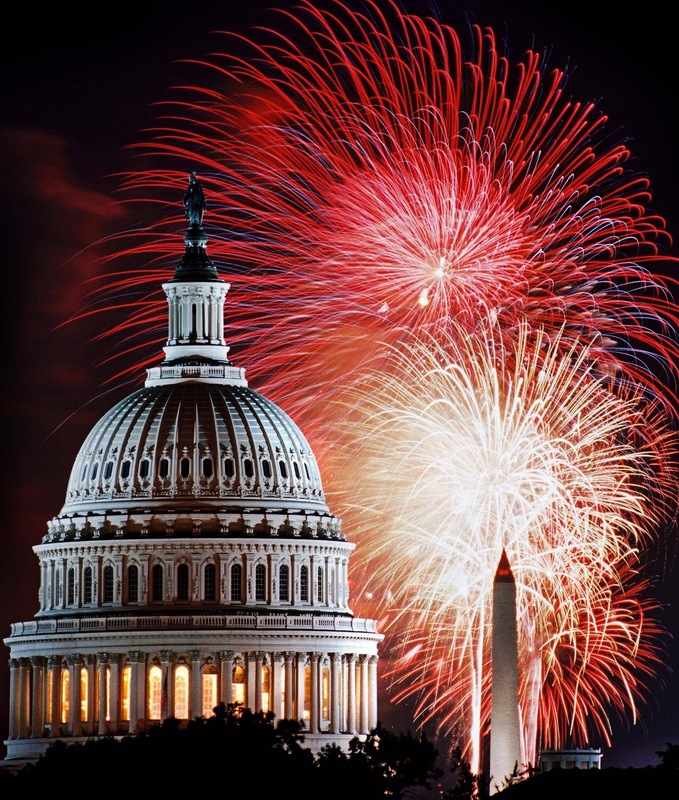 Do you follow the blog Em Celebrates? As soon as you see the header photo, you'll know you're in the right place! Em is a nurse in Washingnton, and she's OOAK! (One of a kind. Heehee.) There's so much enthusiasm and energy on her blog I may have to go take a nap. I love that selvage vase above. 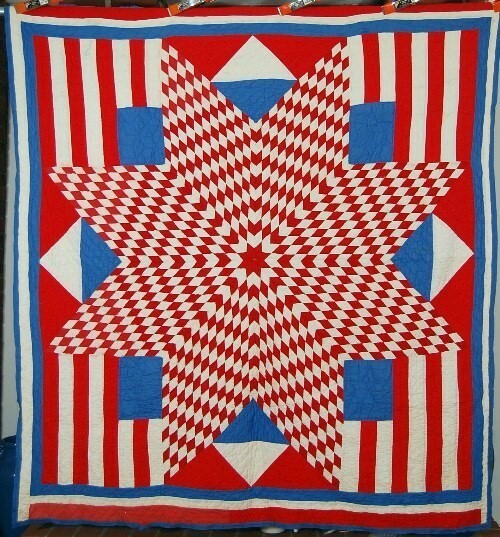 Em says that when she picked up this quilt (below), the machine quilter kept saying that this was the oddest quilt she had ever done. Haha. It's one of Em's favorites. 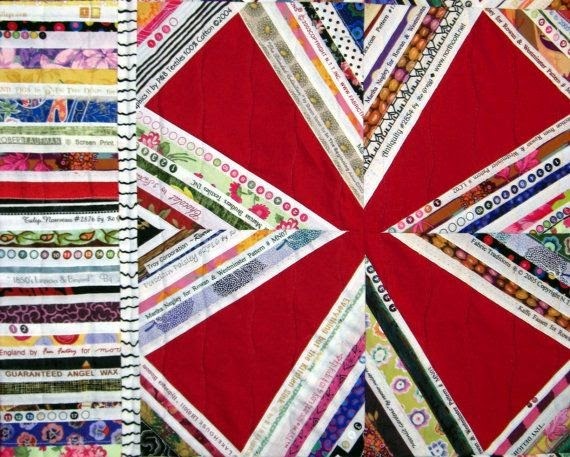 What's the funniest thing that anyone has ever said about one of your quilts? This fabulous selvage spiderweb quilt was made by my friend and quilter/lawyer Martina Odenthal of Cologne, Germany! And there she is in the photo above. 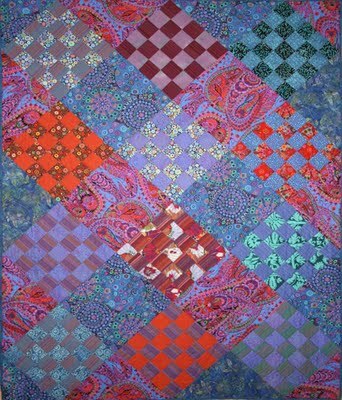 The longarm quilting was done by her friend Brigitte who also chose the perfect backing for this quilt. 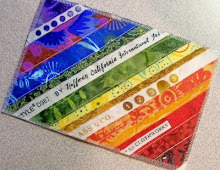 What a great idea to quilt the spiderweb design in the white areas. Their quilting buddies contributed selvages for this big quilt. Beautiful job! See more photos on Martina's blog Stufen Zum Gericht. 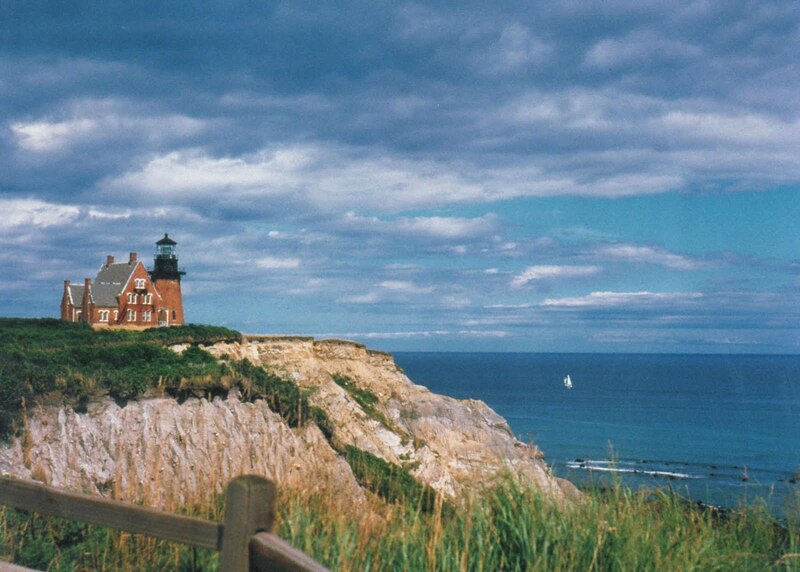 This weekend my DH and I had a wonderful visit with old friends who live in Rhode Island. 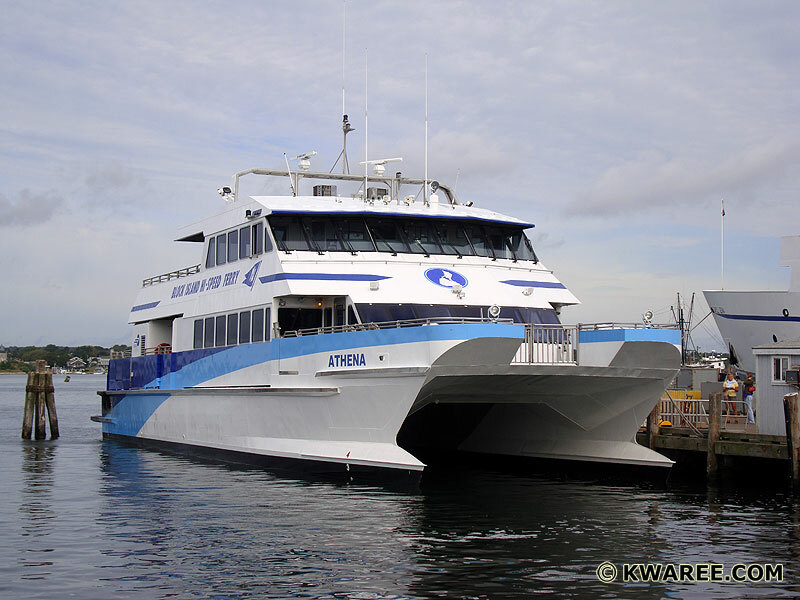 On Sunday we took the high-speed ferry (bottom photo) to Block Island which is about 10 miles off the coast of RI. We walked to the lighthouse at Mohigan Bluffs (above) then climbed the 143 stairs down to the beach...and back! Then we had lunch in town (next photo) before boarding the ferry to go home. What a beautiful summer day. Come back tomorrow to see a beautiful selvage spider web quilt. This little selvage creation is by Five Prime. 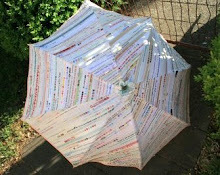 There are pages of inspiring quilt photos by many different quilters there. 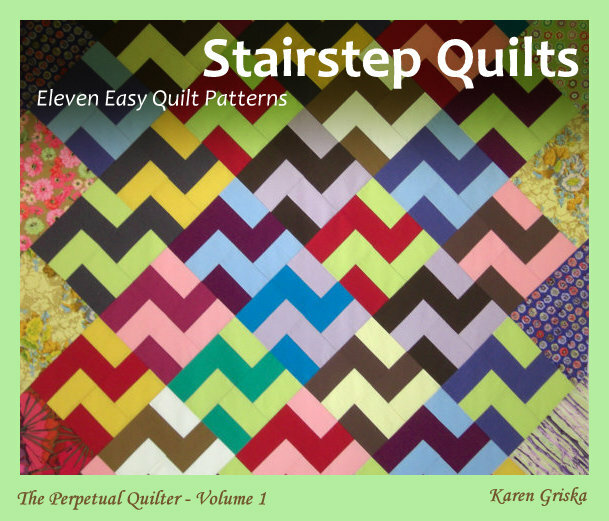 Take a look, but only if you have a few hours to spend in your quilt studio afterwards! 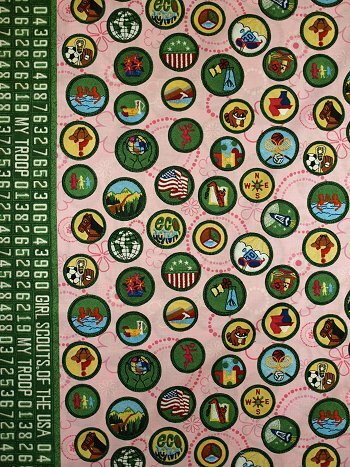 Did you know that there is a big collection of Girl Scout fabric available? 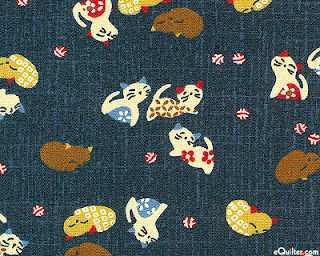 I found it on the Alderwood Quilts site. I would have loved this back when I was a Girl Scout! Look at all those badges. I'm told they don't have a quilting badge. Can that be true? I was a Cub Scout leader for 8 years, but we have no daughters. The little guys were lots of fun, even though they didn't want to quilt, knit, crochet, embroider...haha. Block by Alexis - Good for Selvages? This is a "Crazy Block" by Alexis from the Rebels blog. I like this block just as it is. But an interesting variation would be to substitute a selvage strip for the red stripe. You'd just have to turn under the one raw edge and topstitch. No problem. So many ways to use selvages in quilts! Now you've seen it all! Haha. Riel Nason (acccomplished selvage quilter and author of a brand new novel coming out this October) is making a selvage mummy quilt. She has more photos of it on her blog. 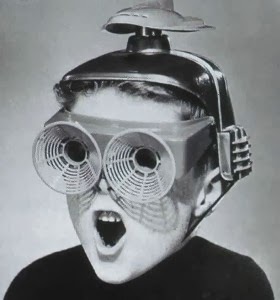 It looks like Riel's son is enjoying this project. I think she's going to win the Very Cool Mother award. My sister Eileen earned that award when she organized a sword-throwing contest at her son's pirate birthday party. I held the title one day when I asked my young sons to kill a rattlesnake with BB guns. It was 2' from our house. We lived in TN. Do you have a Very Cool Mother story? 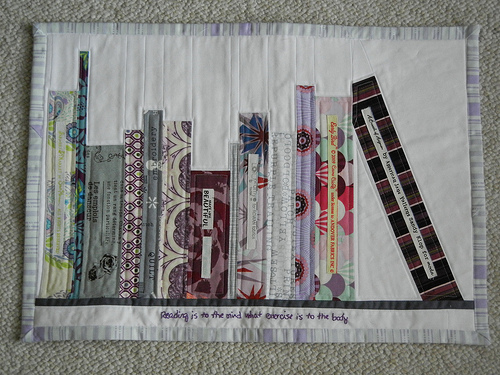 I thought it was time for another post on creativity outside the quilting world. I don't look out there very often. 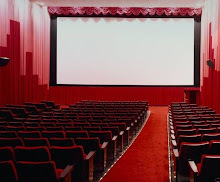 Do you follow Bea's blog? Good thing I took French in high school a million years ago. Haha. Yes, she lives in France. 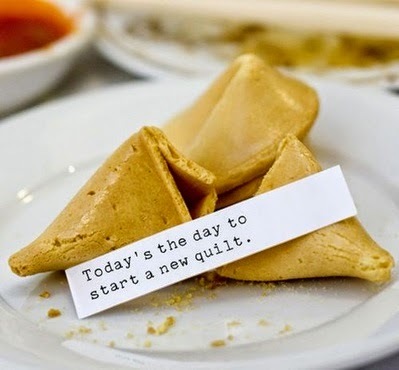 But language doesn't get in the way when it comes to quilts, right? 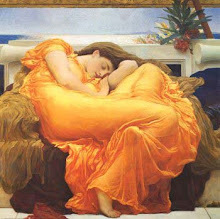 And isn't this wonderful? I love it. Look at that quilting! And all these colors are beautiful. 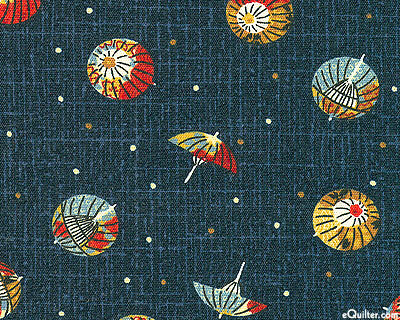 Bea used a pattern by Bonnie K. Hunter. Visit Bea's blog to view more stunning quilts. June Calender of Cape Cod, MA was inspired by the recent bookshelf selvage quilts shown here and she made this charming little (6" x 7") quilt for a swap. June liked doing a project that she could finish in a few hours, including the hand quilting. Most of her quilts are pretty big. June used to be a member of my guild, Empire Quilters in New York City. We miss her. Quilt Inspiration is the name of one of my favorite quilt blogs, and it's well named as you'll see (if you're not already a Follower). These are just three of the wonderful quilts that are featured there now. 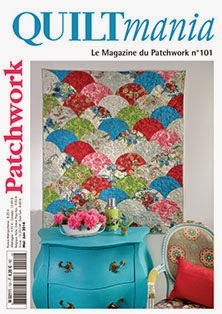 The quilt above is "Brix" by Amy Walsh. Shown above is "Sparkling Spools" by Diana McClun and Laura Nownes. Shown below is "Glorify" by Pamela Goecke Dinndorf. 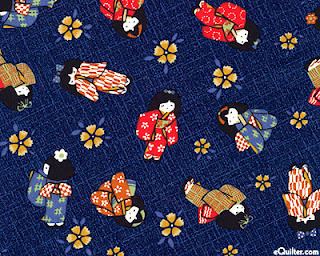 These quilts make me want to drop everything and get to my sewing machine. Kim Redlin from Phoenix, AZ has made a selvage cover for her sewing machine. Didn't it come out nice? She enjoyed arranging the selvages. Notice how she shows hardly any of the printed fabric? Everyone has their own signature style in selvage arranging. The periwinkle edging looks great too. Nice job, Kim! Tami likes selvages and she likes the wonky look, so this little project was perfect. 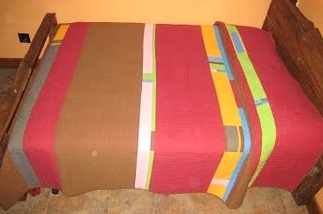 She made it as a gift for her mom's friend who has been saving selvages for Tami. (Once the friend sees how nice selvage projects are, she might want to start keeping her selvages!) She has a Jade Ziger in the works. Wow! 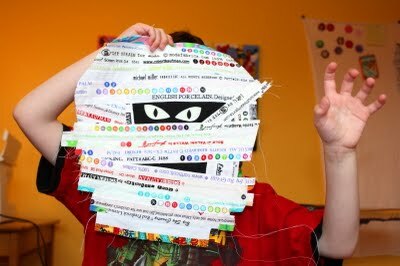 Take a look at Tami's blog, My Life as a Craftaholic. This is one talened lady! 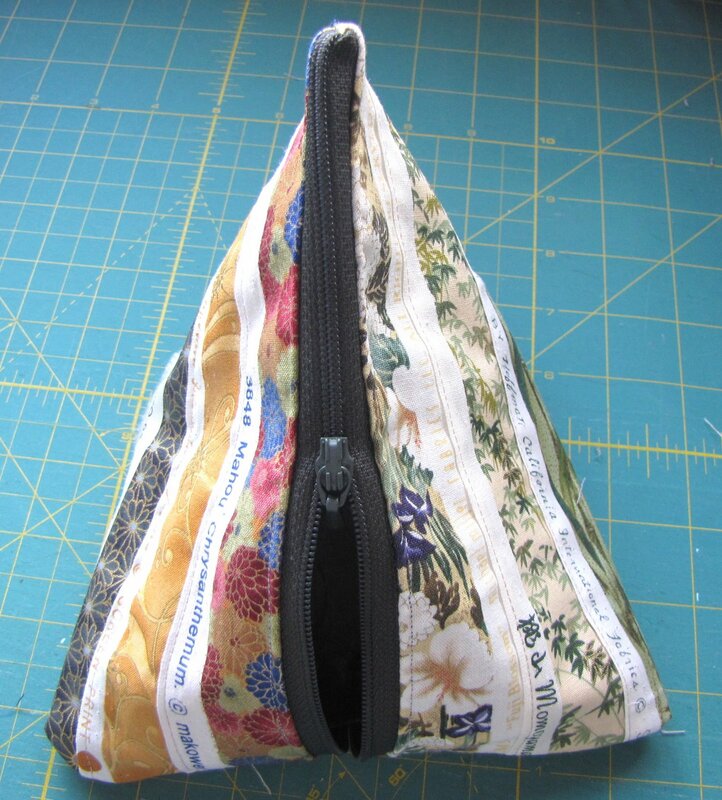 Claudia Hieber of Leinfelden, Germany made this Asian themed, zippered selvage bag. Isn't it pretty? Her selvage collection makes me curious to see her quilts too. 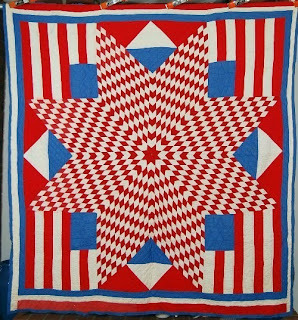 This stunning selvage quilt was made by Beth James of Fairview, Tennessee. The quilt looks shiny in the photo but it's just the sunlight because Beth used regular quilting cotton. So colorful! And I like those red triangles in the corners too. Now she's giving selvages to her sister-in-law to get her started, and to avoid having repeat selvages in her next project! We're 235 years old today! Not that old for a country. "Oh! How beautiful. 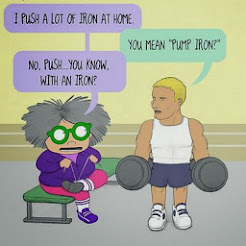 I love that one!" Can't help it. Haha. Take a look at this beautiful selvage backpack/shoulder bag that Di made using the Lazy Girl Chelsea bag pattern. I love those soft colors and the comfy, slightly puckery quilt-look of this bag. It can work as a shoulder bag, or you can un-zip the strap and wear it on both shoulders like a backpack. Didn't she do a great job? 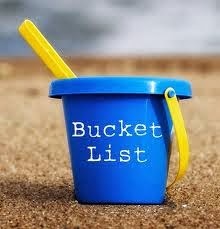 Be sure to take a look at Di's blog Snippets 'n' Scraps. Her crocheted baby shoes will make you smile! 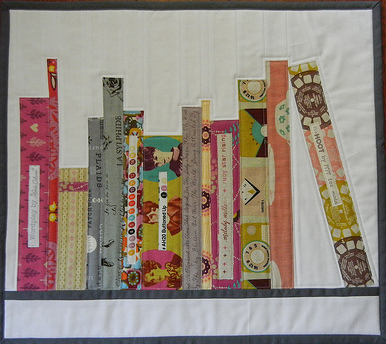 Elizabeth's Bookshelf Mini Selvage Quilts and Tutorial! Elizabeth D. lives in Florida and likes quilting, sewing, baking, blogging, reading, writing, and parenting a 3 year old son. But don't call her Betsy! That's the name of her sewing machine. You'll have to visit her blog to understand this. 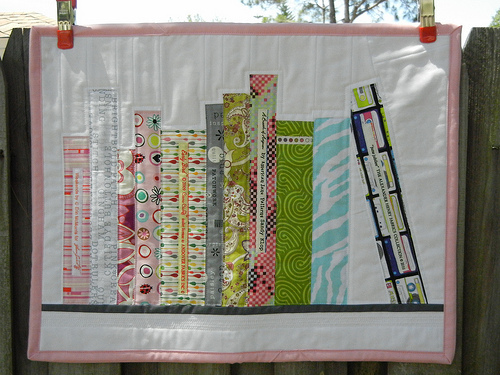 I'm liking these bookshelf mini-quilts! Elizabeth made one for a friend, one for a swap partner, and one for herself. There's even a tutorial to take a look at. Thanks, Elizabeth! See the green book above with the color dots on it? So clever. 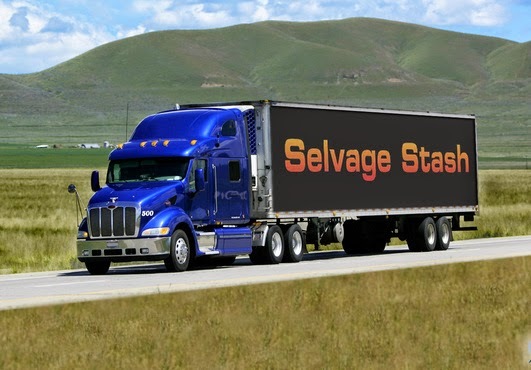 Just a light touch of selvages.